Once again, I am using David Willetts’ book “The Pinch: how the baby boomers took their children’s future – and why they should give it back“. In “The myth of the UK baby-boom” I quoted from David Willetts’ book and showed that he didn’t understand the true nature of the UK’s baby-booms. David Willetts isn’t the only person promoting these myths; many other books and articles state similar views. But this is the one book about baby boomers that I have bought and read, and I have already commented at length at Amazon. David Willetts asserts that actions taken by baby boomers have so distorted the housing market that young people have much more trouble getting onto the housing ladder than the baby boomers did. He showed the numbers in the form of a table, (Table 1 in Chapter 4), which doesn’t have the clarity of a graph. So here is the last row in his table converted to graphical format, overlaid with his definition of the baby-boom. He said (Chapter 4) : “The table shows that half of all [this] wealth … belongs to the the baby-boomers and only about … 15 per cent to everyone under 44″. I thought at first that this implies that a huge number of young people just haven’t got a start on the housing ladder. The over-65s are ahead, then baby boomers dominate. But his definition of “Net Housing Wealth” is “Gross Housing Wealth” (price of bricks and mortar) minus “Mortgages”. This is not very useful: according to this definition, a person who has a house with a 100% mortgage is indistinguishable in this table from a person who has no house at all. This says nothing about how many have got onto the housing ladder. Yet one of the themes of the book is how hard it is for young people to get onto the housing ladder, because the baby boomers have shut them out of the housing market! Here is the first row in the table, the ownership of bricks and mortar ignoring mortgages. This time I’ve overlaid it with my “Two baby-boom” model. 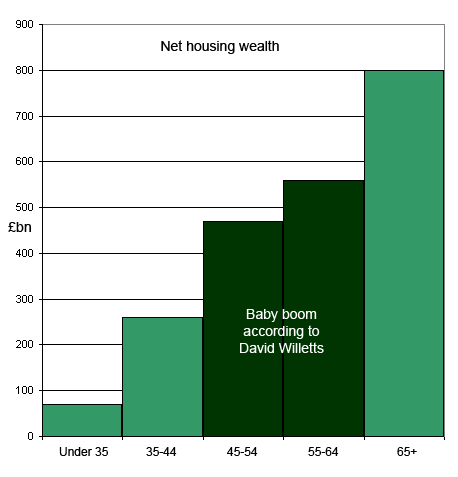 (Caution: the width of the baby-boom 1 column is based on the number of years of that boom, not the housing wealth of that cohort). Even the under-35s collectively have made a start. My first house, bought when I was 28, was vastly inferior to my current house and hardly worth a quarter of it. 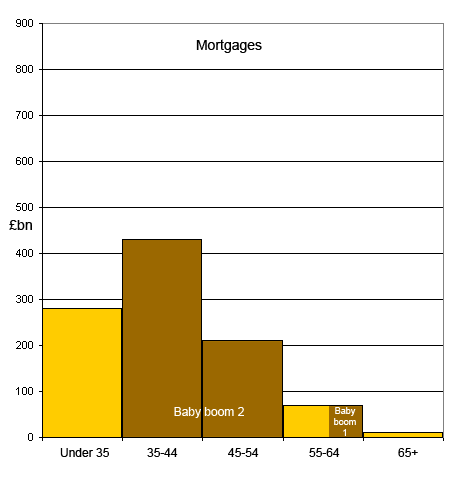 Yet these under-35s have about half the gross housing wealth of any one of the later 10-year groups. 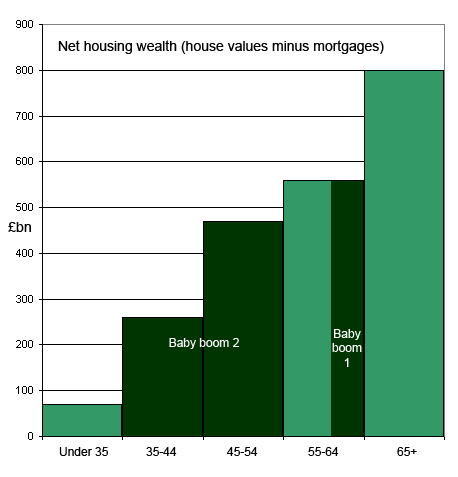 In fact, the under-35s may have a comparable gross housing wealth to baby-boom 1. What the middle row of the table shows is that remaining mortgages differ vastly as we get older. In other words: “young people haven’t paid off their mortgages, whereas to a large extent the 55-64 and especially the 65+ groups have done so”. Wow! So people nearing retirement and after retirement tend to have paid off their mortgages, while younger people haven’t yet done so! Who would have thought it? Here is the last row of his table again, this time overlaid with the “Two baby-boom” model. (Remember: subtract the value in the yellow “Mortgage” graph above from the value in the blue “Gross Housing Wealth” graph above to get this graph). 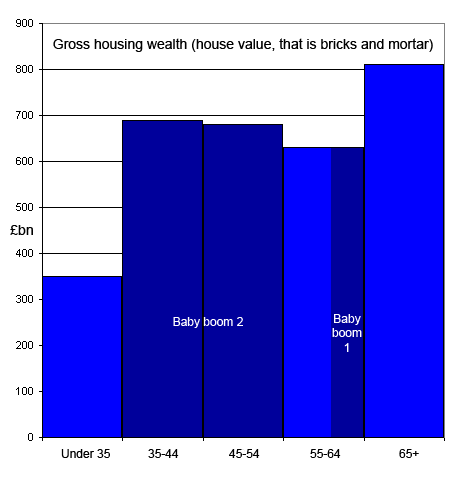 I doubt if David Willetts would have been so keen to emphasise this version, because it shows that the cohort of baby-boom 2 doesn’t have all that much net housing wealth, in spite of their greater numbers in each of their 10-year groups. Although there are rather more baby boomers in total in the “Two baby-boom” model, this greater number of baby boomers actually has significantly less than half of the net housing wealth. What Table 1 in Chapter 4 is really saying is “there isn’t a large difference in bricks and mortar values (gross wealth) for the various age groups, but young people haven’t paid off their mortgages, whereas to a large extent people nearing retirement and especially those now retired have done so”. I am prepared to accept that young people sometimes have a harder time getting started on the housing ladder than I had. But this table (see the blue graph) appears to show that many of them have got started. What are the counts of those houses, and what proportion of people have them? The “Two baby-boom” model shows that there are actually more baby boomers than assumed, and that their average age is less. (See: “The myth of the UK baby-boom“). Some of the people (born from 1966 to 1974) who were previously assumed to be suffering in contrast an older generation of baby boomers (born 1945 to 1965) are actually baby boomers themselves! But do they know it? Is the concept of “baby-boomers” irrelevant? Do we really mean “people born during a period of high birth-rate” (a true baby-boom), or alternatively “people born during 1945 to 1965” (which may simply mean “people currently near retirement and nothing to do with the birth-rate when they were born“)? Or is the problem to do with longevity? Look at all the housing stock in the possession of the 65+ group in the above graphs: is it just taking much longer than previously for houses to become available to later generations? Or is the problem a combination of these?